I would like to thank you for your letter dated 8 February 2013. 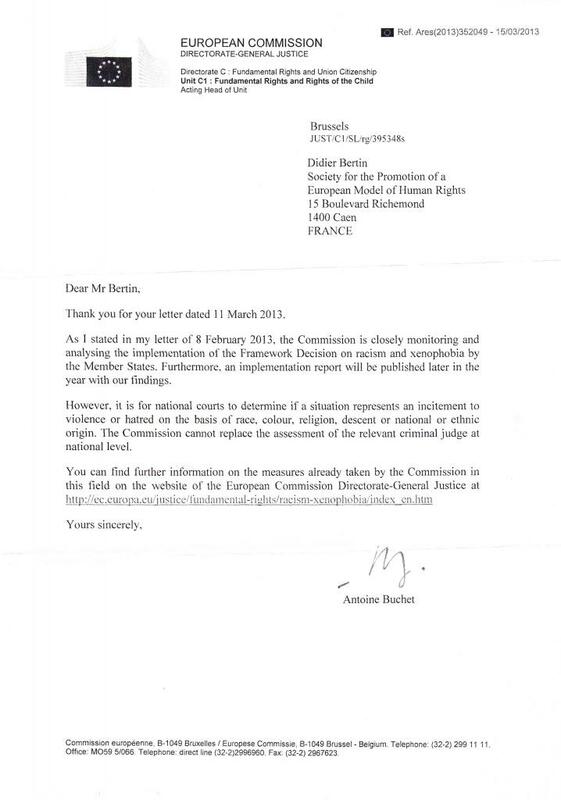 I am glad to read in your letter that " under council framework decision 2008/913/JHA on combating racism and xenophobia, Member States must penalize the intentional incitement to violence or hatred directed against a group of person or a member of such group defined by reference to race, color, religion , descent or national or ethnic origin. " "Member States must penalize" means of course that it should transpose the council framework decision 2008/913/JHA in its legal system and that the public prosecutor will in the name of the Member State take to court proceedings any individual or body disrespecting their own laws as in any democracy. 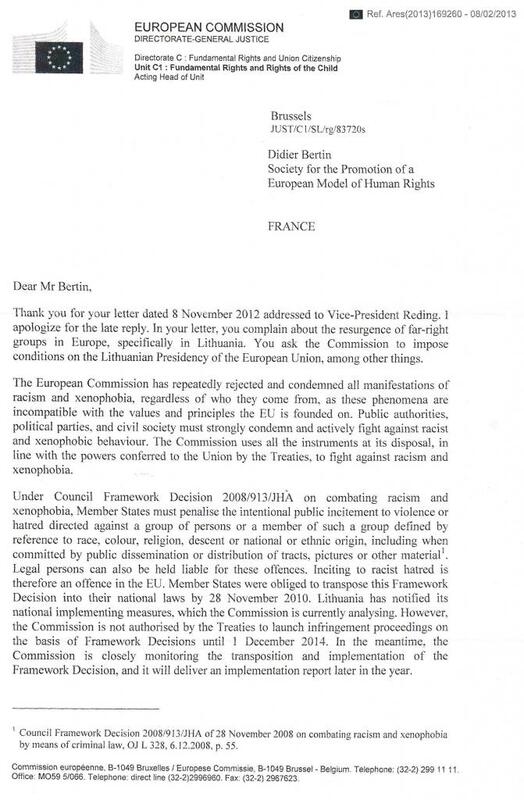 Member States transposing the council framework decision without enforcing it, will not in fact penalize the intentional incitement to violence or hatred directed against a group of persons or a member of such group defined by reference to race, color, religion, descent or national or ethnic origin. We consider this statement to be a written commitment of the European Commission to monitor the transposition of the council framework decision and its enforcement in Member States. In addition we note that from 1st December 2014, the European Commission will be authorized to launch infringement proceedings against Member States not applying the law. The claims against demonstrations of racism and xenophobia will be thus transmitted to the public prosecutor who, in the name of its State, must sue the individuals or bodies not upholding their own law. The matter might be more delicate when a member State itself finances, authorizes or protects by its own police such demonstrations of racism and xenophobia or employs for years and in a top position a leader of a neo-Nazi group as this is the case in the Lithuanian Genocide Research center,. The European Commission should intervene in Lithuania to cancel the shocking legalization of public swastikas in 2010. I am glad to hear that Lithuania will be carefully monitored in this respect and I think that we could also add Latvia and Hungary. In the case of Hungary the independence of the Justice related branches of authority will be impaired preventing thus the fair application of the laws. 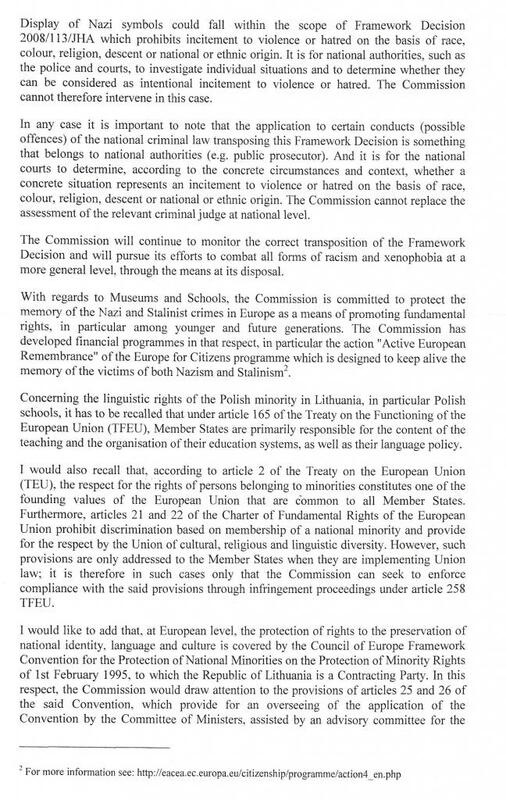 I am also glad to read in your letter that the Polish minority in Lithuania and its educational system may not be impaired as the result the article 2 of the Treaty of the European Union and of the articles 21 and 22 of the Charter of Fundamental Rights of the European Union and that infringement proceedings can be enforced under article 258 of the Treaty on the Functioning of the European Union (TFEU) against the Member States which will not respect the rights of the minorities. Moreover I understand that the articles 25 and 26 of the Council of Europe Framework convention dated of 1st February 1995 prevent also any impairment of the right of the minorities. I will transfer this information to the representatives of the polish minority, who currently suffer local pressures. I also understand that of course the Member States remain primarily in charge of their teaching systems but must take into account the full rights of minorities including their linguistic diversity. I only regret that the active European remembrance program seems to rank on the same footing the victims of the industrialized mass racist and genocidal Nazi crimes and the political victims of Stalinism. They were both victims but of a total different nature of crimes whose European memory should keep intact the difference. This is now a major point on the European scene because of the efforts of the hateful far right in Eastern Europe, posing as center right, to obfuscate and diminish the truth of Nazism (and local collaboration) by way of the bogus Nazi-Soviet equation that is one of the dangerous new tools of the far right.